Starting next year, Penn State has announced, the university will require all incoming freshmen to enroll in an online alcohol-education program before they set foot on campus. 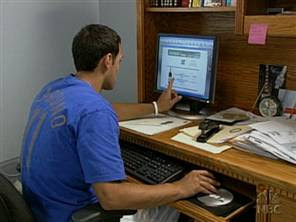 The Web services, to be provided through the Massachusetts- based AlcoholEdu for College program, are already used by more than 200 colleges and universities nationwide. An independent study of AlcoholEdu, done two years ago, showed that program participants reported 50 percent fewer drinking-related problems than those not enrolled. “This program will allow us, for the first time, to educate all incoming students in the Penn State system about alcohol,” said Linda LaSalle, the coordinator of educational services at University Health Services. Past anti-binging efforts have included gatherings in dormitories and poster campaigns. But until now, there was “no way of actually being able to ensure that everyone is being exposed to the same information — or even that they’re exposed at all,” LaSalle said. A $245,000 grant from the John S. and James L. Knight Foundation will help cover expenses of the four-year effort. Penn State also is kicking in some money, though the total estimated cost was not available Monday. The Knight Foundation, which had loose ties to the former Knight Ridder newspaper company, provides targeted financial support in communities where Knight Ridder did business. The Centre Daily Times was sold by Knight Ridder to the McClatchy Co. in 2006. A Knight Foundation director who handles grants in central Pennsylvania could not be reached immediately on Monday. LaSalle said a local advisory committee for the foundation identified alcohol abuse as a key area of concern. Committee members talked with leaders at Penn State about efforts that “could have a transformative effect in the community, which is part of the Knight Foundation mission,” she said. University-supplied data suggest that alcohol-related trouble at University Park has worsened in recent years. The number of Penn State students who make alcohol-related visits to the Mount Nittany Medical Center emergency department grew from 199 in the 1999-2000 academic year to 444 last year. In the same period, the average blood-alcohol level of students who made those visits climbed from 0.221 to 0.235. The threshold for DUI in Pennsylvania is 0.08. AlcoholEdu is a product of Outside the Classroom, a private company based in Boston. Programming for college students is based on science but isn’t preachy, said Erika Tower, the company communications director. She said the program is tailored differently for students who have already begun drinking. Online modules center on how alcohol affects the mind and body, plus brain science, advertising for alcohol, and alcohol’s influence on decision-making abilities. Incoming Penn State students will be required to complete three of four modules before arriving on campus. “We have tried so many different approaches to the alcohol problem over the past decade with, like other communities, seemingly little positive impact,” Penn State Vice President Bill Mahon wrote in an e-mail. It's about time. Penn State has been branded a party school for quite a number of years now. I've heard students say that that particular label was one of the deciding factors for them in choosing a school. More than a little scary. I've been involved in a commission created at one of PSU's satellite campuses, and I was stunned by our chancellor's remark at a public meeting that, "As a commuter campus, we don't have the alcohol-related problems that UP (University Park) has." In terms of numbers, no. In terms of types, she's blissfully ignorant, I'm afraid. A study was conducted to determine the extent of alcohol and drug use on our campus, and the results were used to support our chancellor's point. The problem with the study was that participation was voluntary and there was no real incentive to participate. I can produce a dozen professors who would tell you that the students most likely to show the true extent of alcohol and drug use on campus are not inclined to meet requirements (with the incentive of good grades if they do), let alone offer voluntary information for which they receive no benefit. I just hope that this new program will be instituted at all PSU campuses, not just "party central" where the real problem lies.